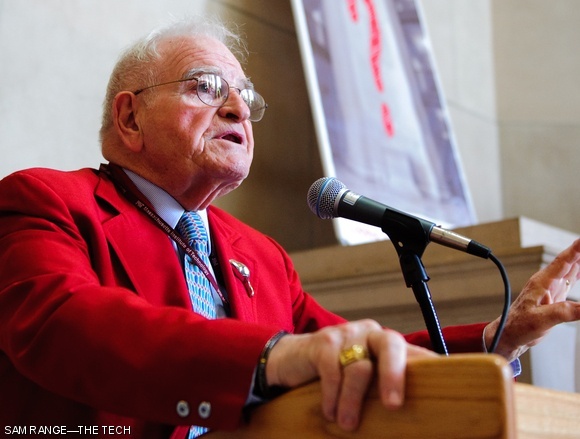 MIT President Emeritus Paul E. Gray ’54 speaks Friday at the inauguration of the Lobby 7 Design Contest. The competition, jointly organized by the MIT Class of ’54 and the School of Architecture and Planning, asks MIT students to decide what should fill the four plinths in Lobby 7, originally intended for statues of Greek gods, but left empty following construction. Prizes of $10,000, $2,500, and $1,000 will be awarded to the top three designs in separate undergraduate and graduate categories. The deadline for registration is Sept. 24, with initial designs due Nov. 5. While the School of Architecture and Planning is involved, MIT’s administration has no intent to actually erect any of the winning designs in Lobby 7.